Kindness is seen in the business world as something of a weakness. If you look at all of the people in power right now, the CEOs, President of the United States, etc., you will see powerful men and women who view kindness as something to be seen as a competitor's weakness that can and is often used against them. However, kindness is also used to be successful too. It is with kindness that we gain things in life. We learn our manners through kindness, we learn to be nice to people, we learn how to be friends to people and to generally be a well rounded human being. Taking the successful secrets of kind people who are in fact CEOs and who are also kind and generally at the top of their game but who also tend to be men and women who got to the top by being nice and kind to others, not stepping on toes. Rhonda Sciortino is an author, speaker, business owner and spokesperson for organizations including Safe Families for Children and The National Foster Parent Association. She is the founder and chairperson of Successful Survivors Foundation, and the national champion of the LOVE IS ACTION Community Initiative. She is a successful survivor of child abuse and is a passionate advocate for children who have been abandoned, neglected, abused, and/or trafficked. She can be contacted through rhonda.org or successfulsurvivors.org. Her goal for this book is to increase your KQ, or Kindness Quotient. At the end of every chapter is a quiz to increase your KQ. You answer the questions and this is supposed to increase your KQ. There is a large scale post-assessment at the end of the book as well as a small area to journal your thoughts and feelings about kindness and your kindness quotient. One thing she brings up and that is authentic kindness is a character trait. This is true. You are either born kind and brought up to be this way or you are not. I consider myself to be a kind person and I tried to bring up my kids this way. I consider myself to be considerate of other people's feelings and I like to do something completely altruistic as often as I can. She also mentions that if you want to be happier, be kind. You will be surprised at how this can lift your mood. Doing something nice for someone else, instantly makes you a happier person. Also, try not to take offense at everything. And this is a biggie. If you didn't get invited to a party, don't dwell. Think, well maybe it was a get-together for a specific group of people. Don't shoot yourself in the foot and say anything. Not everything that we think has to fall out of our mouths. An act of kindness is thinking about what we will say before we say it. You can also increase your happiness or kindness quotient by developing a thick skin. Which is important. Remain uninfluenced by unkind words. Instead of being disingenuous you will be considered above the fray. The Greater Good Science Center at UC Berkeley reports that, "Kindness Makes You Happy and Happiness Makes You Kind." Another way to impart kindness is to be an ambassador of kindness. If say your friend is having trouble with her husband, instead of saying bad things about the husband, say good things just in case things turn around. Because she will remember all the bad things you said. In giving kindness, you give someone dignity. Say for example you are kind to someone who has lost their home. Being kind and donating money to that person even though he or she may not be able to pay you back is a great way to show kindness. Because that person may not be able to pay you back, but he or she will pay if forward in acts of kindness. And it makes that person feel more valued and not as less dignified in the eyes of society. Also, just asking someone how someone is doing and actually listening to their answer. You don't have to fix anyone, just listen. One important fact. Kindness cannot be conditional. You give it that's it. Do not expect anything in return. And especially don't do it based on the worthiness of the individual. You will not become proficient at being kinder overnight. It takes time of course. But you will become a better person for it. There is more to share in the book but I will leave it up to you to read. This is a self-help book that actually helps you be a better person, and in this day and age we could all use this. I can think of a few people I would send this too right away. However, that is not the goal of the book. Help yourself. Then only can you truly help others. 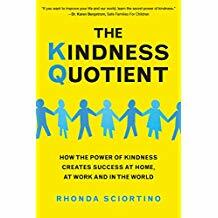 The Kindness Quotient: How The Power Of Kindness Creates Success At Home, At Work And In The World by Rhonda Sciortino retails for $15.00 US and $20.00 CAN. It can be purchased online at www.amazon.com. Or at www.barnesandnoble.com and Barnes and Noble stores.